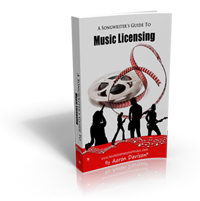 For three days only, get all of How To License Your Music.com's resources about the music licensing business (excluding master classes) for one low price. 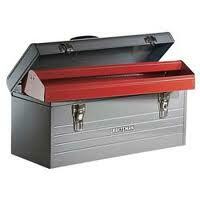 Save $220.00 off the regular price of purchasing these products separately. 2014 TV/Film Music Business Directory ($39.97 Value) - The most comprehensive directory of contact information for the TV and Film markets on the planet. Period. 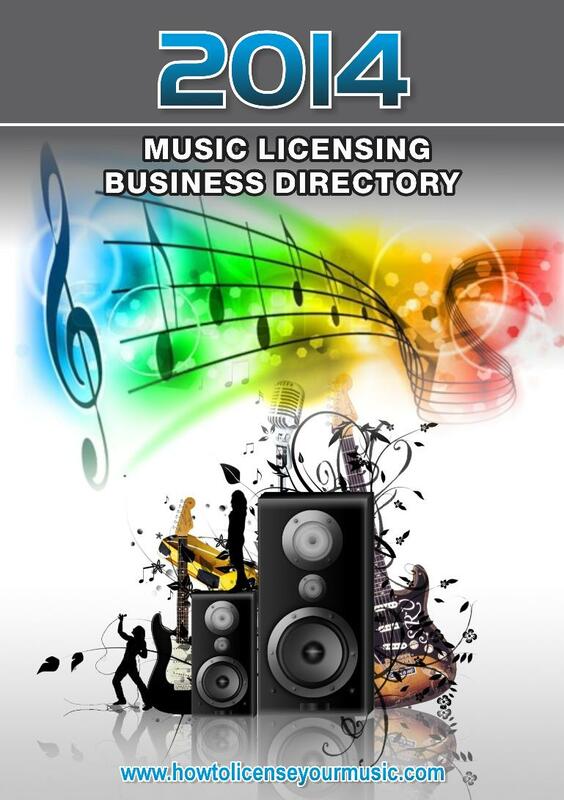 Over 1,600 up to date listings for music supervisors, publishers, music libraries and video game companies. 360 pages. Audio Interview With Michael Redman - Michael Is The Founder Of My Music Source.com - In This Audio Interview Michael Covers Many Different Aspects Of The Music Licensing Business - Learn What It Takes To Succeed Directly From An Industry Insider! All The Audio Files in the program are accesible as both streaming audio files or as downloadable Mp3's that are compatible with your Ipod or other portable mp3 players. Sample Licensing Contracts ($9.99 Value) - Learn how actual deals are structured in the sample contract section. See actual real world examples of different licensing contracts! Thirty Years In Thirty Days! 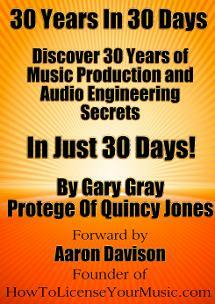 ($19.97 Value) Learn thirty years of music production and audio engineering secrets in just thirty days in this new ebook from How To LIcense Your Music.com's audio/engineering expert Gary Gray. Gary is a protege of Quincy Jones and has over 30 years of experience to draw from. In this new ebook Gary breaks down the secrets of of production and engineering he he has learned over the last three decades into very easy to digest lessons designed to be learned over the course of 30 days. 1) An Interview With John Buckman Of Magnatune - During this half hour audio interview with John Buckman, the owner of Magnatune, you'll learn what kind of music tends to get licensed the most and you'll find out the best path songwriters that are new to licensing their music can take to get started licensing their music in Film and Television. 2) An Interview With Jason Greenberg Of Soundscape Media - During this interview you'll hear from Jason Greenberg, owner of the Canadian based music library, Soundscape Media. You'll hear Jason's thoughts on why he selects the music he selects and ways you as a songwriter can find out about more licensing opportunities and increase your overall chances of licensing your music. 3) An Interview With Mark Brinker Of Freeplay Music - Mark works in the licensing department at Freeplay and he works directly with music supervisors who approach Freeplay looking for music for their projects. Learn what kind of music supervisors are looking for and how Mark helps supervisors find the right music for their projects. 4) An Interview With Beth Wernick Of Imaginary Friends - Beth is the owner of a small indie catalog of music and she's placed a LOT of music in a LOT of projects in both TV and Films. During this interview Beth shares a lot of great insights about ways songwriters can more successfully connect with licensing opportunities. You'll hear a lot of great and very specific advice in this interview! 5) An Interview With Chris Davison Of Fliktrax - Chris is the owner of the new music library, Fliktrax. During this interview discusses what it's been like creating a music library and breaking into the music licensing business. You'll learn a lot of great tips and strategies that you as a songwriter can implement based on what Chris has learned during his experience at Fliktrax. 6) An Interview With Tyra Elder Of Ishlab Music - Tyra works in the music acquisition department at Ishlab and is responsible for selecting the music that is included in Ishlab's catalog. Learn the criteria uses to select music in this interview and learn how you as a songwriter can increase your chances of getting your music accepted into music libraries in this interview. 7) An Interview With Instrumental Music Composer Darko Saric - Darko has been very successful at licensing his instrumental music in a variety of television projects. Learn how Darko got started and was able to succesfully start licensing his music and how you can do the same in this interview. 8) An Interview With Tracey And Vance Marino - Learn all about the power of networking in this interview with husband and wife songwriting team, Tracey and Vance Marino. Tracey and Vance have had great success licensing their music and they've succeeded by networking. During this interview they share their story and give great tips on how you can network with people in the industry and get more placements. 9) An Interview With Aaron Davison Of How To License Your Music.com and Music Licensing 101.com - Last but not least you'll hear from yours truly being interviewed by the Grammy winning producer, Khaliq Glover. Khaliq has worked with artists such as Michael Kackson, Stevie Wonder and Prince. During this interview Khaliq interviews me about how I got started licensing my own music and ultimately started helping other songwriters learn about the business. Learn why I'm so excited about music licensing and why I think it's something every songwriter should know about in this interview! And twelve more interviews! Learn more here. 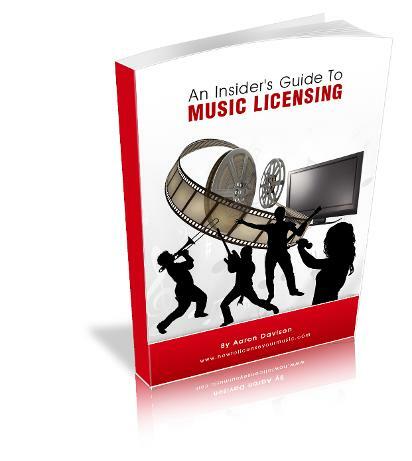 Brand new 202 page ebook details everything you possibly need to know about licensing your music in tv, films, video games and more! This ebook will sell separately for $24.97 but is yours as a free bonus this weekend only when you get the "Music Licensing Toolbox" combo. The Complete Musician's Guide To Creating An Online Empire ($49.97 Value) - This weekend only, when you purchase the Music Licensing Toolbox you'll get my newest program, The Complete Musician's Guide To Creating An Online Empire, free. This in depth program covers how to develop and launch your own internet business. Make a part time or full time income online, while pursuing your passion of music. Includes an hour long audio program, bonus audio interview and bonus PDF resource guide. Advanced Music Licensing Strategies ($29.97 Value) - When you get the Music Licensing Toolbox this weekend you'll also receive my newest program, Advanced Music Licensing Strategies. In this hour long audio program you'll learn advanced ideas and concepts for licensing more of your music. 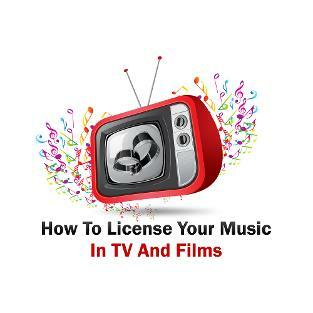 "How To License Your Music In TV And Films" ($39.97 Value) is a two hour video course taught by How To License Your Music.com founder, Aaron Davison. The course is instantly accessible online and features 17 different video tutorials between 5 and 30 minutes long, each covering a different aspect related to licensing your music in tv and films. Just $59.97 Until Sunday, November 2nd! Just got one of my songs placed in Roadtrip Nation thanks to your info! Hi Aaron; I purchased your licensing program and directory 3 weeks ago, I just received a licensing placement agreement last week placing 4 of my songs in the company's catalogue as a result of your program. Thanks so much! Just wanted to say thanks for your awesome program! It's great to know that there is information like yours available. I'm excited to get started! I think this is some wonderful information and will soon be using it. I will keep in-touch with possible questions and updates on how well this works out for me. I sent you an email a few weeks ago asking about your thoughts of pitching my music ( Mostly Blues & Jazz ....But also Guitar intrumentals, folk, French cabaret, Christmas and some Traditinal Country )and actually making any money at the library thing. Your reply was that these genres were not yours and you couldn't really comment on that domain . Well here's the lowdown after 3 weeks of hard work sending emails and submitting songs online and via CD by mail. I'm in the process of signing two songs to a publishers thanks to your info! Thank you!! thanks for all your info and directory. such a great help! I must say I find your products extremely helpful....keep it up!!! Great, inspiring information….exactly what I was looking for in regards to publishing and the like. Much appreciated!! Yesterday I purchased your Film/TV directory and I must say it is a whole lot different from "Song Writers Market" book. It's great! 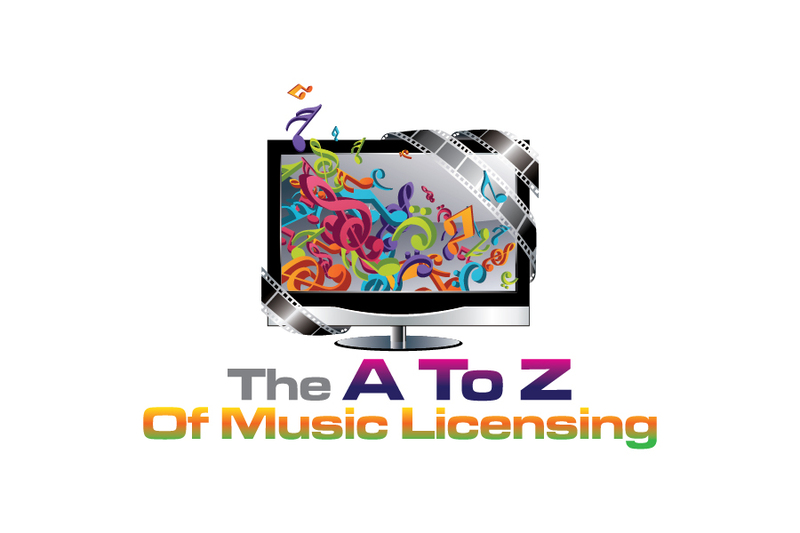 I did purchase your 'A-Z of music licensing' and the directory. I think they are great! Aaron,How are you? My name is Tim Byrd and I purchased your online version of your program. It's great! Thank you.